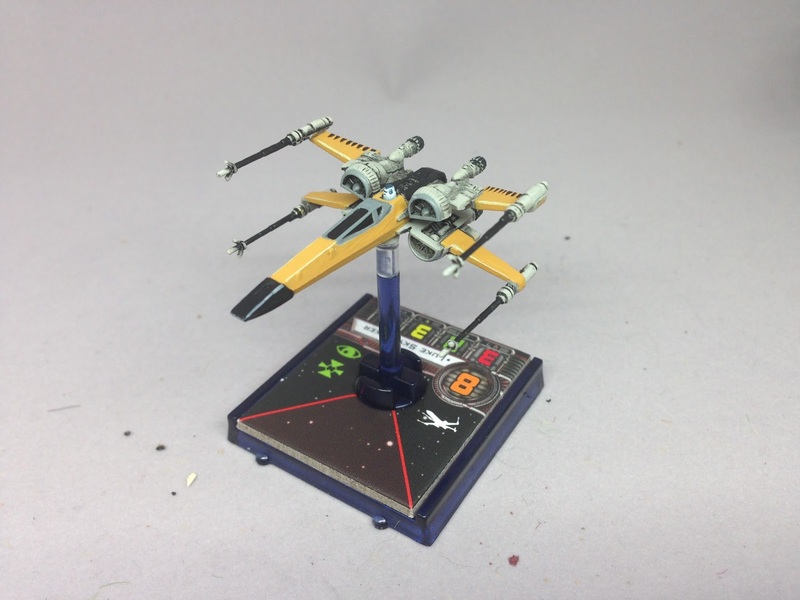 My friends and I started a Star Wars X-Wing Heroes of the Aturi Cluster last Friday. It became apparent almost immediately that we were going to lose track of which X-Wing was which. To fix this, I decided to paint up one of my T-70 X-Wings. Ignore the base. I realize it's from the wrong ship. I just grabbed a random base. Start out with a T-65 and 5 XP in the bank. (4 XP left) Spend 1 XP for an R2 Astromech. (2 XP left) Spend 2 XP for Vectored Thrusters. (4 XP needed) Spend 6 XP to upgrade to PS3. (7 XP needed) Spend 3 XP for Push the Limit. (15 XP needed) Spend 8 XP to upgrade to PS4. (20 XP needed) Spend 5 XP to upgrade to a T-70 X-Wing, gaining a better maneuver dial, a boost action and an extra shield. (22 XP needed) Spend 2 XP for a Pattern Analyzer. It'll take a total of 22 XP to get to where I want to be. After out intro mission, I have the original 5 XP I started with plus an extra 5 XP. That means I have the R2 Astromech, the Vectored Thrusters and I'm at PS3. (25 XP needed) Spend 3 XP for a Stealth Device. (35 XP needed) Spend 10 XP to upgrade to PS5. (38 XP needed) Spend 3 XP for Predator. (50 XP needed) Spend 12 XP to upgrade to PS6. (54 XP needed) Spend 4 XP for Shield Upgrade. It's going to take a bunch of weeks to get where I want to be, but I think this is my clear progression.